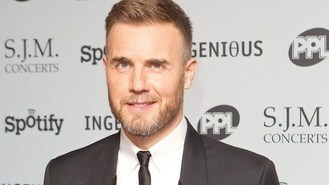 Gary Barlow has admitted he might not return for another series of The X Factor if Simon Cowell comes back as a judge. Simon is reported to be set to reprise his place on the ITV1 show, following a dip in the ratings. "Could I judge alongside Simon Cowell if he came back? Hmm, I don't know," the Daily Mirror quoted Gary as saying. "I have enjoyed this series more than last year, but the show feels like it has been going on for a year this time. If this is my last year, I've had a lot of fun and enjoyed every minute." The Take That star, 41, spoke at London's Royal Albert Hall, before he went on stage for his solo show. Gary and Simon are said to have had their disagreements since a biography, which was written with The X Factor boss' approval, said Gary was "wooden". Ed Sheeran has revealed that even the royals think he looks like Prince Harry. James Corden is set to return to presenting duties for next year's Brit Awards - while controversial artist Damien Hirst will design the statuette. Westlife's Kian Egan has revealed his son is already a budding musician at just 11 months old. Carly Rae Jepsen has said she hopes her success will last - as she wants to be "Cinderella for life". Ten artists, including an unsigned singer-songwriter, have been hailed as the most exciting new stars of the music scene. Festive favourite The Fairytale Of New York is back in the charts 25 years after it was first released. Celine Dion has revealed that her on-going residency in Las Vegas was a risk worth taking. Psy has set a Mission: Impossible for himself.